I signed the delivery slip for the UPS driver and rushed downstairs again, careful not to drop the precious box. It was May of 2006, but it felt like Christmas to me! I cut open the tape with one side of my scissors, dug through the packing popcorn and produced my prize — my first digital SLR camera. I grew up with a trusty 35mm film camera and in university, I used a Sony Mavica that saved its photos to a 3.5 inch floppy disk. But a whole new world awaited me with this powerful and modern camera! I’ve updated it several times since then, but I will never forget the freedom that first camera brought me. With one of my horses, Theo. Photo by Megan Kruse. I am often asked if I went to school for photography. Originally, my Bachelor of Arts degree in Psychology at the University of Lethbridge was intended to launch me into the world of equine behaviour research and training. However, I took photography and new media courses as electives, and by the time I graduated in 2008, my interest in photography had become much more than a hobby. I was already in demand for my equine photography and portraiture, and was apprenticing with a high-end wedding photographer. I had a natural eye for composition, and continued to educate myself in the technical and business aspects of photography. After obtaining my university degree, I backpacked solo around Australia and New Zealand for nearly a year. I took thousands of inspiring photographs while there, and returned home eager to continue my journey with my camera. Ultimately, the tables on my plan turned: I now train horses as a hobby, and photography has become my career. 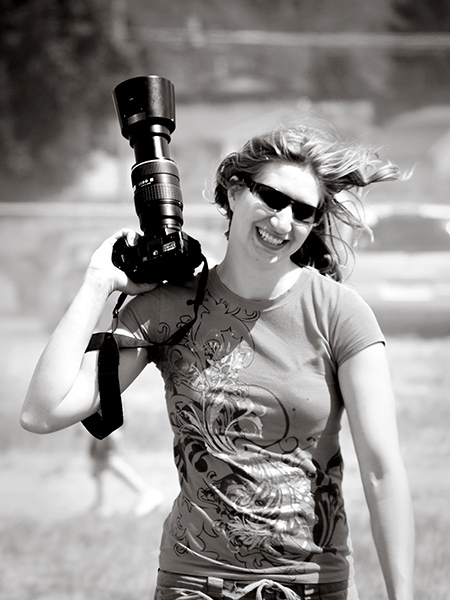 I officially launched my wedding, equine, and portrait photography business 2009, and have worked full-time in my business ever since. I moved to Barriere, British Columbia (near Kamloops) in 2011, to pursue better weather with a longer warm photography season. Below are photos of me in action, taken by assistants and friends over the years — as you’ll see, I have a habit of finding a high vantage point! I also don’t mind wading into water or climbing through shrubbery to get a unique angle. I believe everyone should have beautiful photos that illustrate what you’re passionate about — your partner, your family, your pets — or whatever inspires you. You can share that love with others with vibrant, true-to-life imagery, and high quality prints and products. Whenever you look at that canvas on the wall or flip through your album on the coffee table, you will be transported back to that instant. Contact me to inquire about creating your own photographic memories. 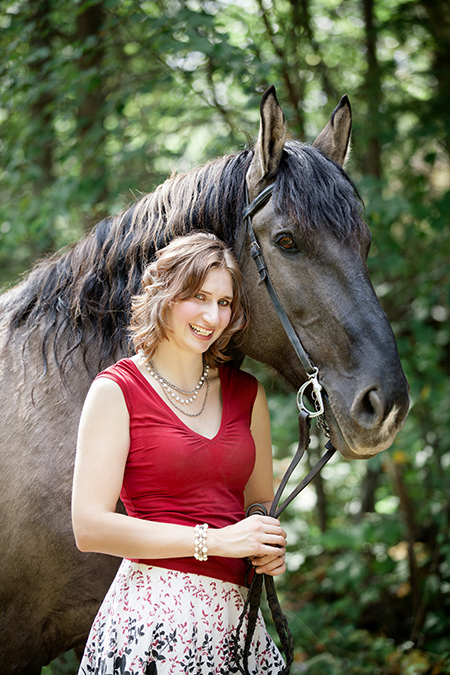 Over the years, I have commissioned many professional photographers and aspiring friends to photograph my husband Chris and I, along with our animals. Our home is filled with beautiful prints, canvases, and albums. Below are some of my favourite photos of me with the people and animals that I love! Too long? Didn’t read? Scrolled to the bottom? In a nutshell: I have a Bachelor of Arts, have been photographing professionally since 2006, adore Australia and New Zealand, am married to a wonderful guy, ride horses and train our Irish Terrier in my spare time, and oh — I play a mean game of Scrabble! Want to challenge me to a game? I’ll give you free print with your next session if you can best me! Write to me.